BOCA RATON, FL (November 10, 2013) – Demonstrating its commitment to making a positive difference in the community where its employees live and work, Sklar Furnishings of Boca Raton sponsored the construction of Habitat for Humanity’s most recent South Palm Beach County home. 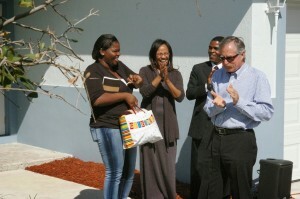 The keys to the four-bedroom, two-bath home were presented to new homeowner Erica Heath and family by Sklar Furnishings principals Rick and Pat Howard with Sklar General Manager Cyndi Rigley in attendance at the recent home dedication ceremony Habitat for Humanity’s neighborhood community at Ocean Breeze West in Boynton Beach. 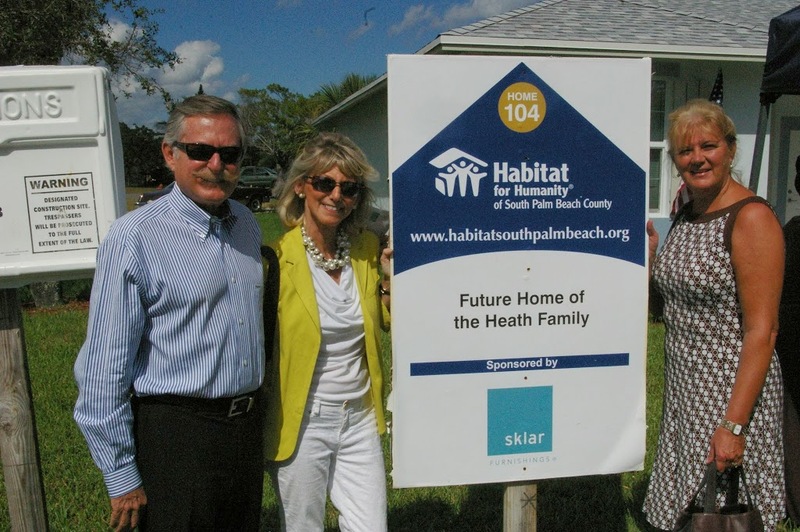 Since Sklar Furnishings — a Florida-based contemporary furniture store with an emphasis on high levels of design and customization — opened its doors in November 2002, ownership and staff established a strong partnership with Habitat for Humanity. Sklar Furnishings donates thousands of dollars in merchandise to the organization that is sold in Habitat for Humanity’s ReStores; the proceeds go right back into Habitat for Humanity’s underwriting of residences. When Rick Howard joined the Board of Director of Habitat for Humanity in 2009, Sklar Furnishings took an on-going active role and expanded the company’s support of the Habitat for Humanity mission. For its efforts, Sklar Furnishings has been a recipient of the “I Gave at the House” Award six times. 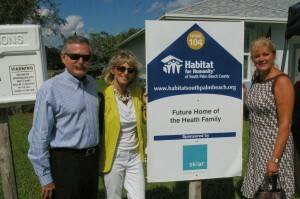 The new Heath household is one of eight Habitat for Humanity homes (with three currently under construction) in Palm Beach County that have been built as part of an initiative to construct Ocean Breeze West, a development of 21 single-family homes on Seacrest Boulevard in the heart of Boynton. The houses are of a similar design to ensure a cohesive community, and are built in for families who demonstrate a need for housing and a willingness to work with Habitat for Humanity to purchase a home of their own. For more information on Sklar Furnishings and its initiatives to “give back to the community”, visit www.sklarfurnishings.comor call (561) 767-8093. For more information on Habitat for Humanity of South Palm Beach County, headquartered at 181 SE 5th Avenue, Delray Beach, FL 33483, visit www.hfhboca.org, call (561) 819-6070, or email info@hfhboca.org. Sklar is committed to Your Space, Your Lifestyle, Your Choice. Founded to be the best contemporary furniture store in Florida, Sklar Furnishings provides consistently high levels of design and service to its customers making customization the foundation of its philosophy. It’s what sets Sklar apart and, ultimately, sets its clients apart. Selections allow customers maximum freedom in expressing their own personal style by specifying the exact color, fabric, wood finish, shape and size of their furnishings, from sofas and tables to wall systems. Sklar is a good neighbor and steward to our planet, making a positive difference in the community in which it does business and beyond. For more information on Sklar Furnishings and its initiatives to “give back to the community”, visit www.sklarfurnishings.comor call (561) 767-8093. Habitat for Humanity of South Palm Beach County (SPBC) is a nonprofit, 501(c)(3) organization that works to provide affordable homeownership opportunities for hardworking and deserving families in the cities of Boynton Beach, Delray Beach, and Boca Raton, Florida. We build homes in partnership with families who demonstrate a need for housing and a willingness to work with us to purchase a home of their own. With the help of our generous supporters and volunteers, since our establishment in 1991 we have empowered over 100 families in our community to achieve their dream of owning a safe, decent and affordable home. For more information on Habitat for Humanity of South Palm Beach County, headquartered at 181 SE 5th Avenue, Delray Beach, FL 33483, visit www.hfhboca.org, call (561) 819-6070, or email info@hfhboca.org.